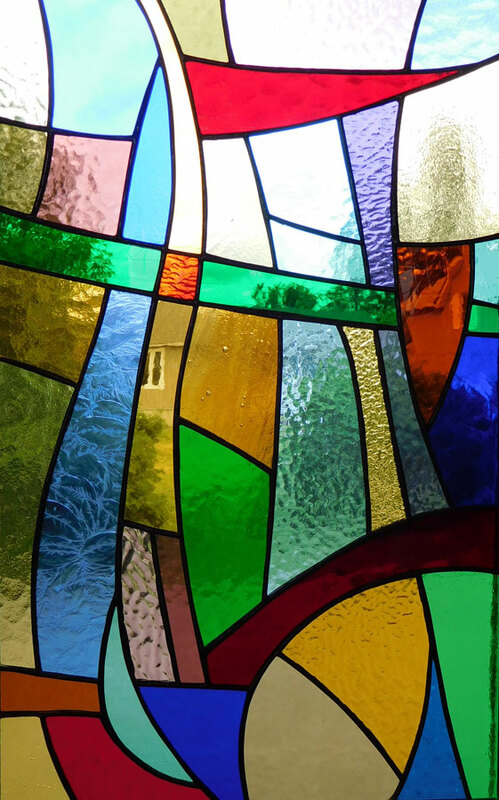 I usually create my own designs but a few years ago I saw this tiny (just over an inch square) picture in a magazine and thought it would be a good candidate for a stained glass panel – I sometimes get lazy! So I cut out that tiny picture, modified it somewhat and am just finishing my version of the original. 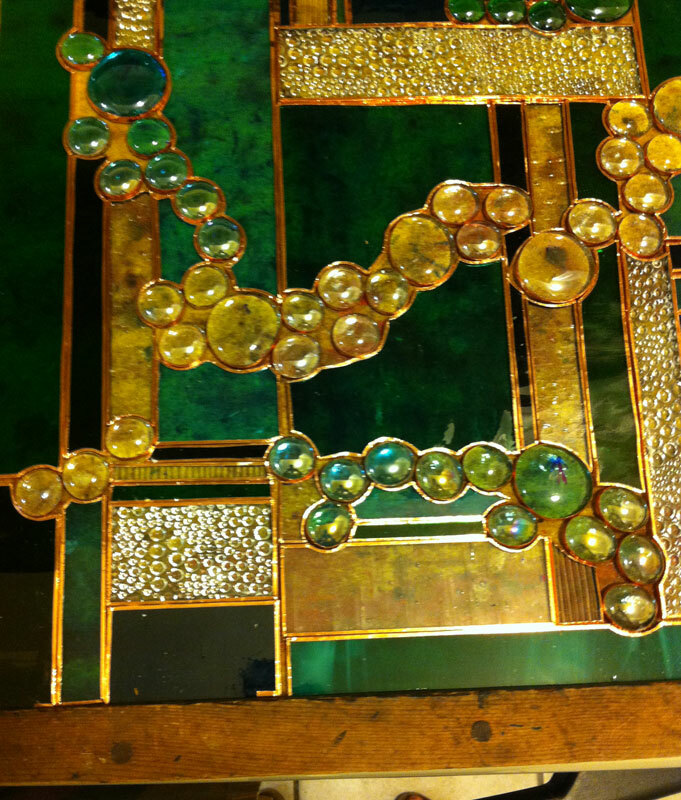 After making sure I had the appropriate glass and enough came on hand to frame the finished piece, I cut and laid out the black glass border in a 12×13 jig after taping the inside edges with 7/32″ copper foil. Next I cut out the trees, ground the edges, taped them, and after the corners of the black border were soldered I soldered the trees in place. This gives me a relatively stable framework that can be lifted slightly so that I can slip the glass for the individual bands of colour underneath, trace the shape, cut, grind, tape and tack-solder each in place. I started at the bottom with the green-brown band a worked my way up to the sky ( which alone used 5-1/2′ of copper foil). A finished solder bead is then applied to the face of the panel. 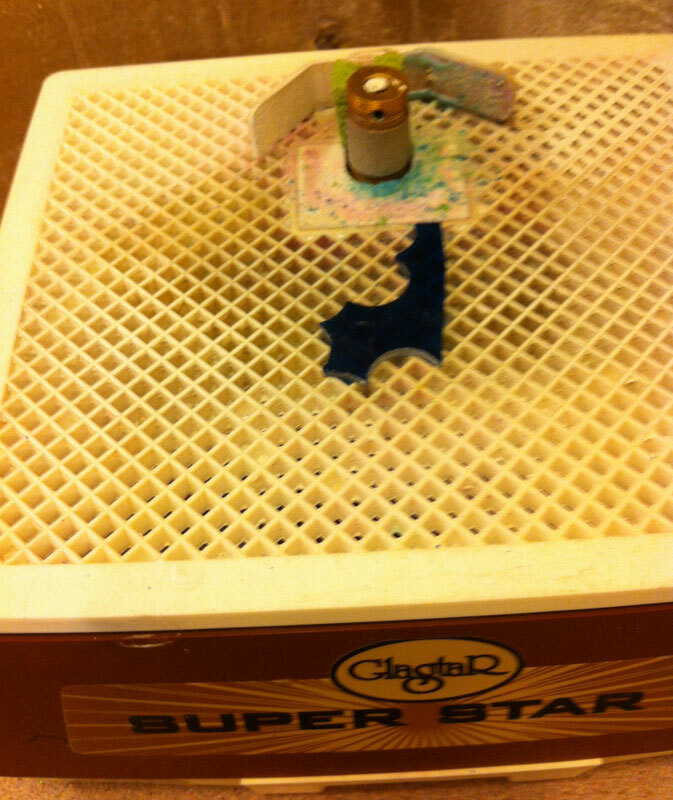 It is then flipped over to solder the reverse. The zinc came is then cut and soldered to the black glass border. Wire loops are soldered to the upper reverse side corners. 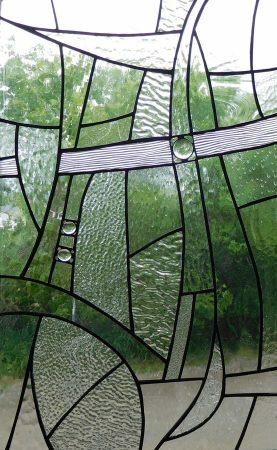 A confession – I have never mastered darkening the fame successfully so after thoroughly cleaning the glass and applying the patina to darken the solder, and cleaning thoroughly once again, after everything is dry, I paint the zinc frame. ( a no-no, I’m sure! )I then polish the piece with furniture wax – and hope someone will buy it! I am somewhat restricted re the size of any project now as I have to work in my apartment Kitchen. 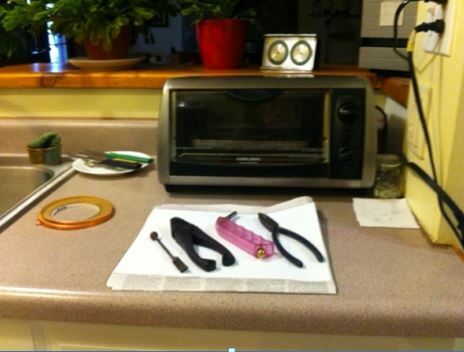 I cut glass in a 12×26″ area between the wall and the sink in front of the toaster oven – I have to tape glass there too as the light is good. (My eyesight is not so great now and I see double at times ). My grinder is beside the stove, close to the one reliable outlet on on the stove side of the kitchen and where my work board sits. 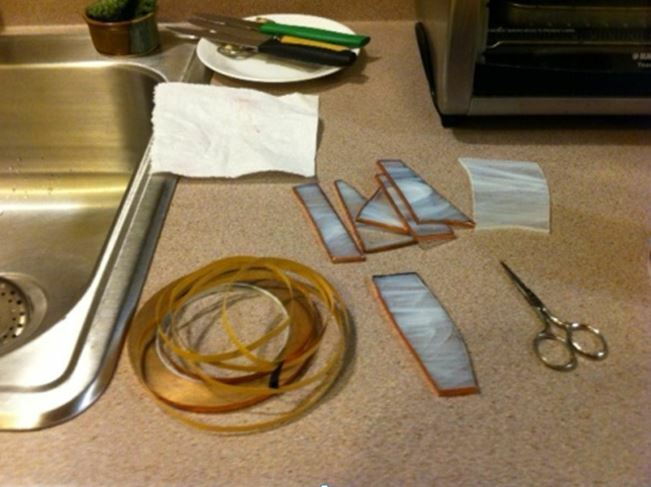 Before I can solder however, I must press down the copper foil firmly on each piece of glass with a fid. That job is done on the other side of the sink. So now I’m ready to solder. 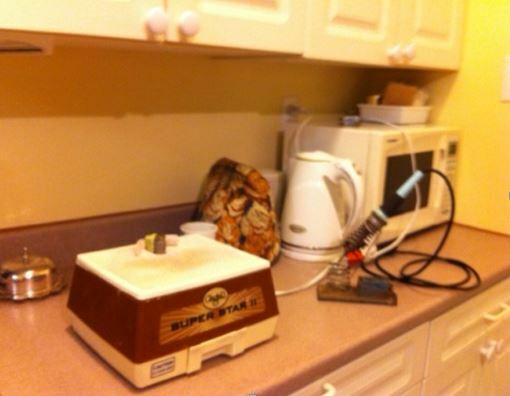 The soldering iron is plugged into the same reliable outlet used by the grinder, the kettle etc. the stove top is OK except if I want to cook or bake. The whole set-up is not great, but I no longer have the luxury of a shop – great sadness! A plug for the Scugog Library’s annual Snowflake Sale (a fund raiser for the library which takes place in the month before Christmas). My work is there along with that of a dozen or so locals. So if you are in Port Perry, do some of your Christmas shopping at the library! Mary will be next at the gallery on July 23rd. 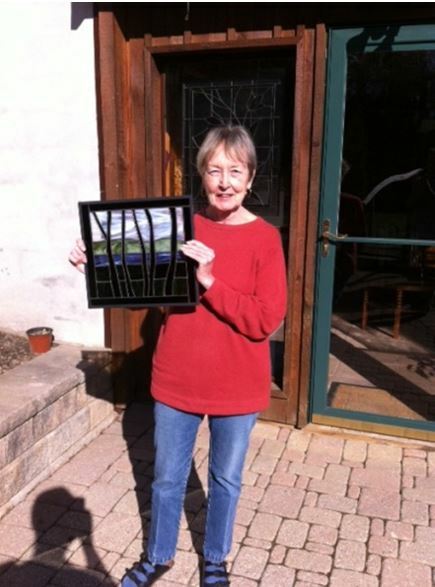 Last fall I was a participant in the Kawartha Art Festival in Fenelon Falls. This was my first year attending this event and I enjoyed meeting the artists from the town and area. 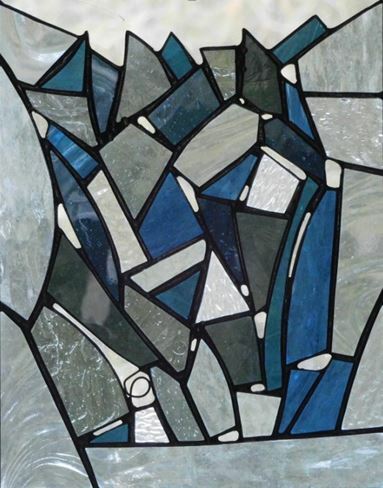 A couple came to talk to me about my art and asked questions about my custom Stained Glass work. They told me that they were renovating a 100-year-old farm house in the area and wanted two transom windows created for above the doors in an inside hallway. They gave me a sample of what they were envisioning and I followed up with several drawings created on my computer. This went back and forth a few times until we had the perfect one! 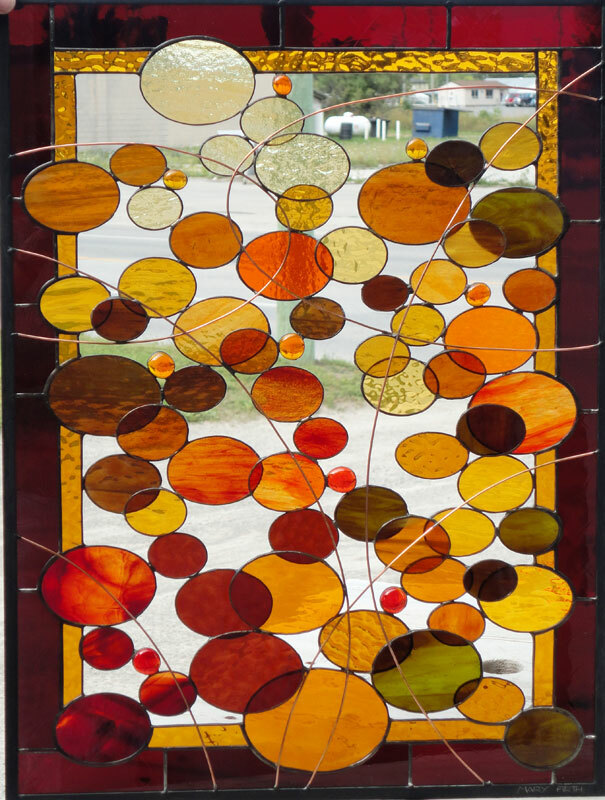 Next, they came to my home studio and picked out the glass from samples, the glass was purchased and the project began. 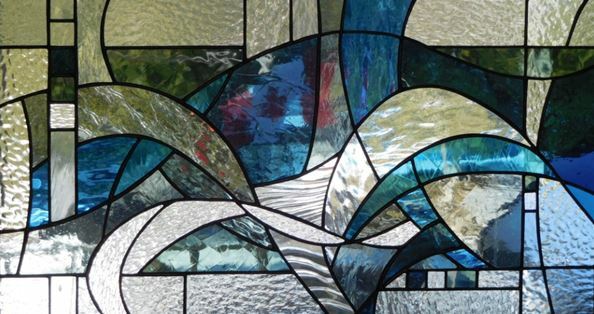 This was a very complicated pattern that I had created and was very challenging to recreate in glass to say the least! Everywhere I went for the two months that I was working on these windows my fingers where wrapped in bandages because I had so many cuts on my fingers. The gold glass was particularly treacherous! A couple of months later the windows were finished and I brought them to their home to check the fit. Thankfully they fit perfectly and the couple was over the moon with the finished product. The look of wonder and excitement expressed on their faces as I held them in place made all those hours of cutting and grinding and fitting worthwhile. Their Maple Leaves vision will be installed shortly when the hallway is painted and ready! My Unique Stained Glass Scissors…and no, I don’t run with them! 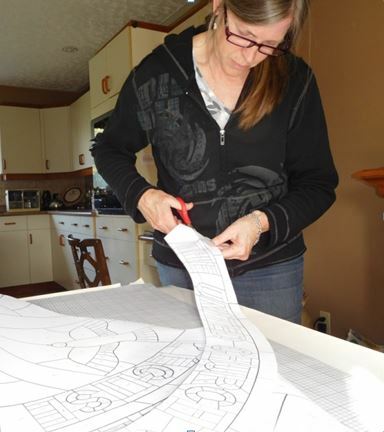 Before building a stained glass panel, I design the pattern and make two copies of it. 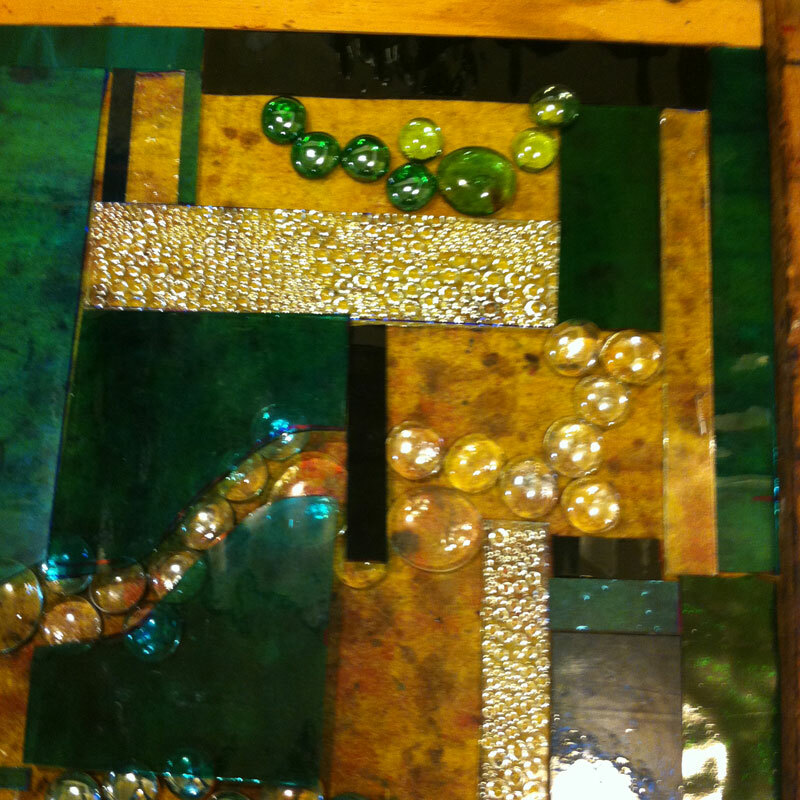 I build the glass panel on top of one copy, and cut up the other copy to use as pattern pieces. This second copy gets cut out with a special pair of lead shears. These shears have three blades which automatically remove a thin strip of paper between the two pieces being cut, to compensate for the width of the lead came. This allows the glass to fit together perfectly when assembled with the lead. This process can be time consuming…and we haven’t even started cutting the glass! 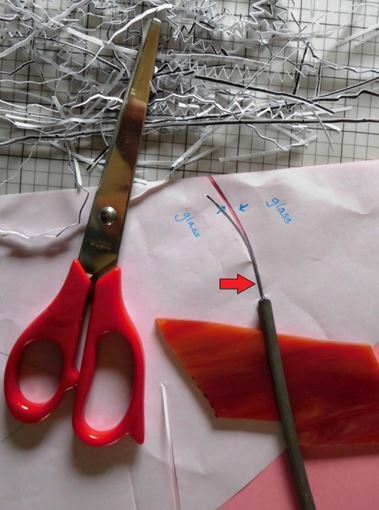 Janet’s special shears…you can see where the strip of paper is removed to allow space for the lead came. I am really pleased to be selected as one of the four new artists at the Fenelon Station Gallery. I have just spent the winter recovering from a serious break to my left arm on October 19th and have been chomping at the bit to get back at it! I have so many ideas crowding my brain that I must start to make them come to life soon…or explode! 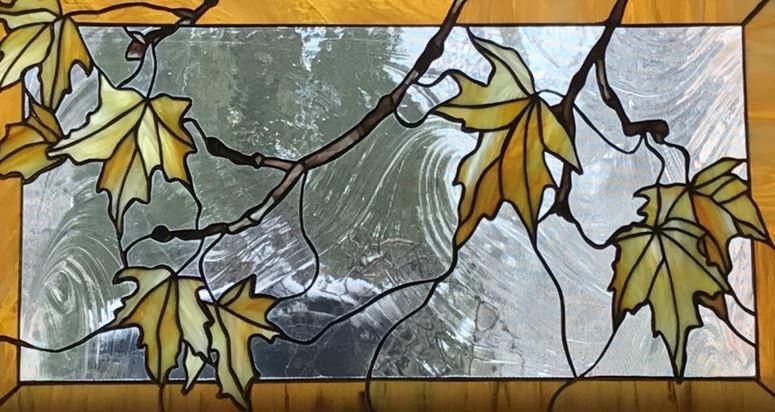 Most of my work featured in the gallery is in the fused glass medium due to limited window space to display my Stained Glass pieces so I am going to create some smaller Stained Glass items for sale. Thankfully I had an inventory of fused jewelry and decorative items ready for Art and Craft Shows in the Fall, and at Christmas Shows…so there is lots to ponder over. 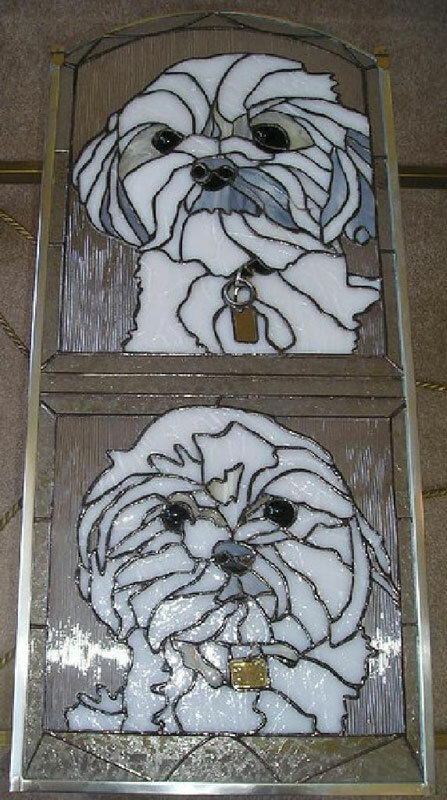 One of the commissions that I am most proud of was a Stained Glass Panel of two dogs. My client wanted to thank a friend for going above and beyond when she needed help. Her friend absolutely loved her dogs so she secretly took a picture of each dog and asked me to capture their look and personalities in glass. 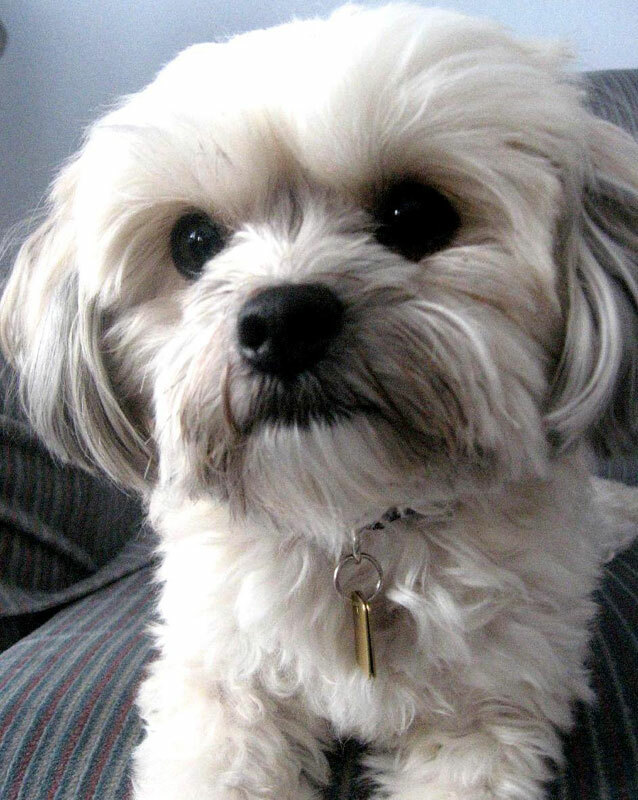 This was probably one of the hardest things to create….but I was really pleased with the outcome and the dog owner was “over the moon” with happiness when she received the gift! She cried and cried when she opened it. This is the ultimate compliment that an artist can receive and makes all that we labour over worthwhile. 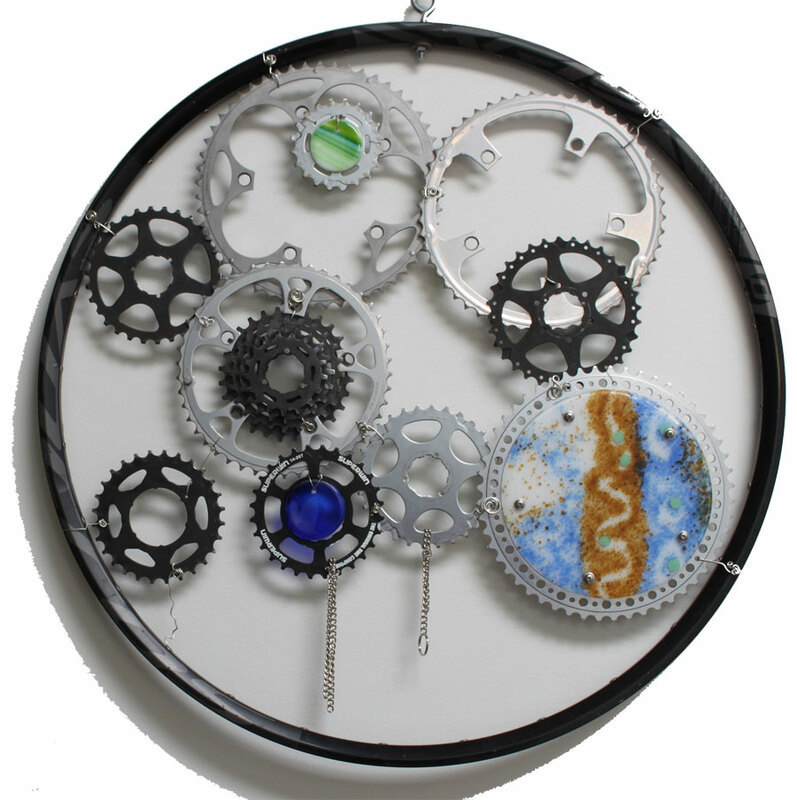 Drop by the gallery and see all of the new pieces that will arrive during the next months! I’ll be in the gallery next, on July the 7th & 8th. Perhaps I will see you there! Magazine photos, paintings, old stained glass windows in century homes…and mostly people, like the young father of three, who asked me to make him something special for his wife last Christmas. 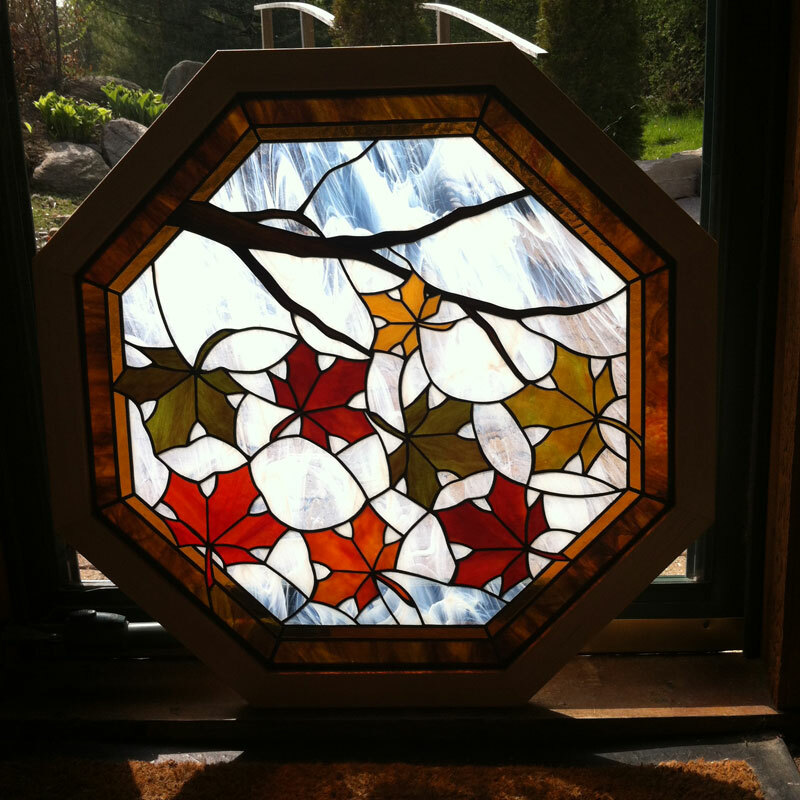 He asked me to build a transom window to sit over the doorway of his family room. He wanted the word “family” to be in the design, but didn’t want it to stand out. So, pencil in hand, I started sketching a design. From there, the building of the panel begins. The end result…see for yourself. If you look closely, you will see heavy lead lines to indicate the letters in the word, FAMILY. It was a fun project to work on, and the young husband earned many brownie points too! I’ve not written a blog before and no doubt will write very few in the future, primarily because I do not have a computer (and don’t intend to get one!). So I have to rely of the generous nature of my friends to get such this to the Station Gallery website. I have said that my eyesight and my hearing (I listen to classical music most of the time) were my most treasured senses. Well 2 1/2 years ago (on my 70th birthday yet) my optic nerve was permanently damaged. 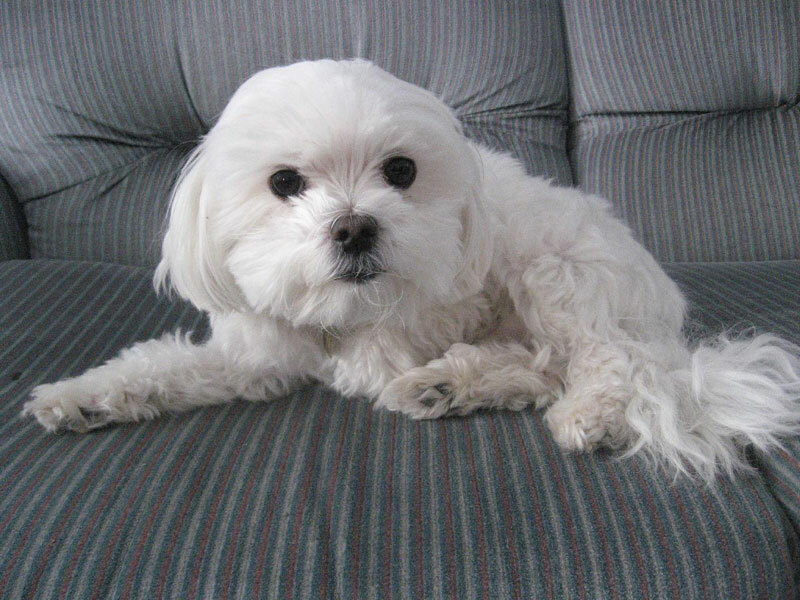 I have temporal arthritis – and as a result I now see through a hazy blur with my left eye. My right eye was never wonderful as I’ve been wearing glasses since I was 16 months old, so although it’s a challenge now to do stained glass or any other fine close up work, I will carry on as long as I can. The glass has kept me busy and seen me through some rough patches. 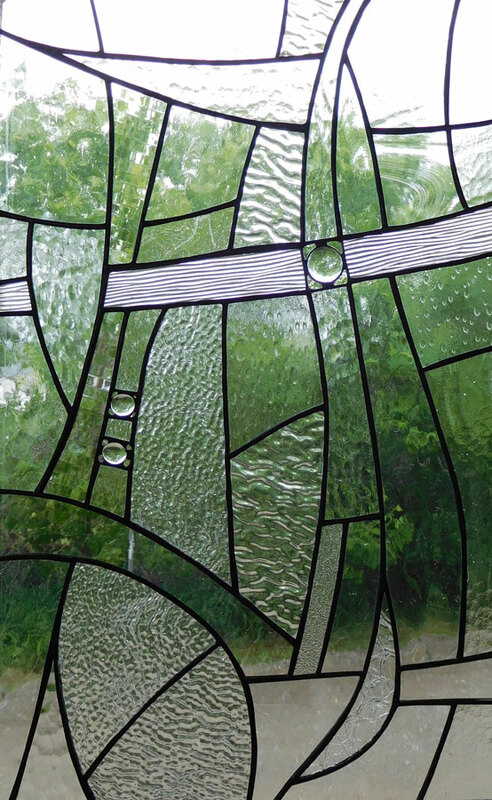 Each project now takes longer because I can’t see well enough to cut each piece of glass as accurately as in the past. (What would I do without my grinder?!) But I still love working with colour and texture and creating my own designs. I’m a member of the library in Port Perry and so for 2 years now I’ve sold my work at their annual Snowflake sale (a fundraiser for the library) in the month leading up to Christmas. 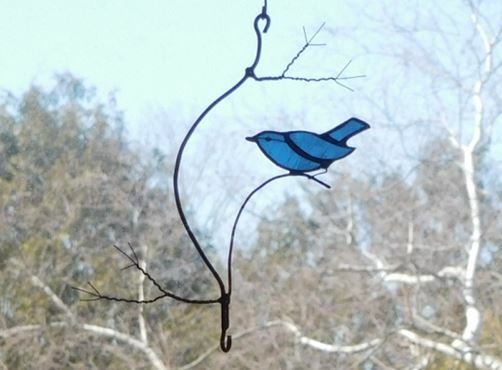 So if you need some wonderful little stained glass gifts for Christmas come to the Scugog Memorial Library in Port Perry! But you will see me in the Fenelon Station Gallery all this summer.